A boatload of toppings gives this seafood treat a burst of flavor in every bite. It's topped with chopped veggies and a homemade vinaigrette that's mouthwatering before it's even cooked! Place salmon in a greased 15-in. x 10-in. x 1-in. baking pan;sprinkle with 1/4 teaspoon salt. In a small bowl, whisk the oil, vinegar, honey, mustard and remaining salt. Spoon 1 tablespoon over each fillet. In a large bowl, combine the tomatoes, onion, green pepper, olives and remaining oil mixture. Spoon over fillets. Bake at 425° for 12-15 minutes or until fish flakes easily with a fork. 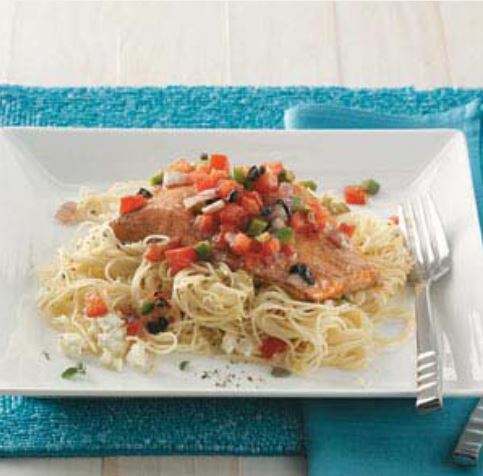 Serve over thin spaghetti noodles or rice noodles. Recipe formatted with the Cook'n Menu Planner from DVO Enterprises.